Have to keep reminding myself of spring, now that it’s here, and we’re still mired in that cold, damp weather that makes outdoor activities miserable. 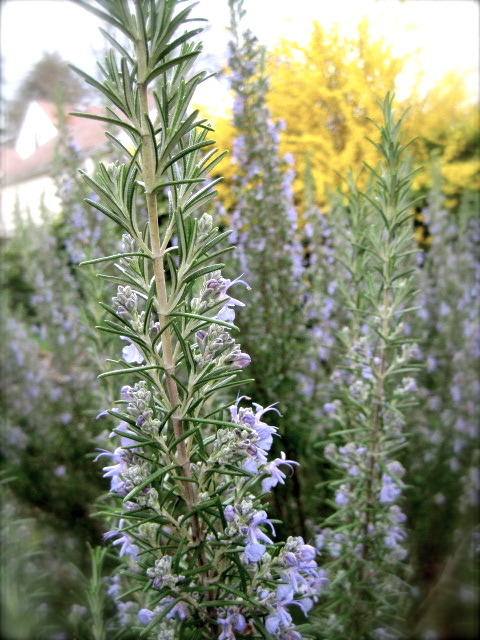 Anyone have any rosemary flower recipes? I have a giant, spear-straight rosemary that is the sole pollinator in my garden right now, and is thus covered in bees, but I’d be willing to sacrifice a few stalks for something wonderful. I’ve seen recipes for rosemary flower biscuits and candied rosemary flowers, but the latter seems too fiddly and the former too floury. Maybe a riesling jam with the flowers? Or a simple syrup? If you’re still prosecco-y, I highly recommend a cocktail of bubbles, bitters, and yes, rosemary flower simple syrup. Takes some fiddling to keep it from being too sweet, but is quite lovely. I’ve also had a lot of success with that syrup in a modifed French 75 (less sweet) or other gin-inflected drinks. Oh, I’m proseccoey. That does sound like a good spring aperitif. The flowers would turn the syrup a pale pink, I’d hope. You’d have to promise to drink one with me, though! You could make ice cream with the flowers, if you have a lot, or maybe you could use them to infuse some vodka? Like to make a liqueur? I add them to salads with other flowers, or sometimes sprinkle them on a steak with Maldon salt just to be prissy.